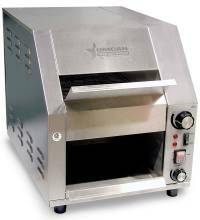 Star’s Holman QCS compact conveyor toaster has been designed and engineered for the budget minded small volume operation. 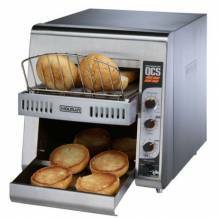 The QCS toaster is compact and versatile requiring minimal counter space and delivers perfect toast, bagels, buns, English muffins, frozen waffles and more for about the price of a pop up toaster. Holman’s superior quartz infrared heaters provide faster, more consistent heating than traditional heating elements. 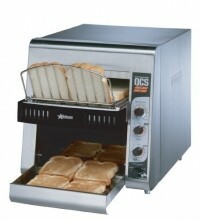 Holman’s forced convection system keeps the toaster cool to the touch and extends the life of critical components. The forced convection increases productivity by re-circulating pre-heated air into toasting chamber. 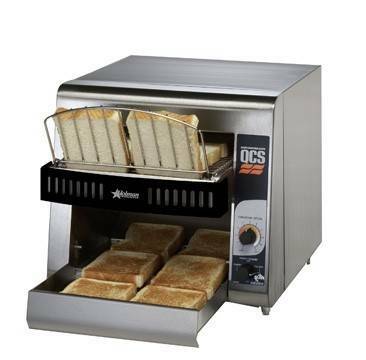 This compact conveyor toaster is constructed with corrosion resistant stainless steel, and supplied with heavy-duty motor, drive chain and fast heat up quartz infrared heaters. A conveyor belt tension system is supplied for a smooth, quiet operation. This unit is supplied with variable speed control, power saver and high limit switch. In addition, there is an extended conveyor belt, crumb tray, heated holding area and full width burn guard are standard. This unit is perfect for restaurants, coffee shops, kiosks, caterers, concession stands, snack bars or a variety of other foodservice operations.